The discovery of the relationship between magnetism and electricity was, like so many other scientific discoveries, stumbled upon almost by accident. The Danish physicist Hans Christian Oersted was lecturing one day in 1820 on the possibility of electricity and magnetism being related to one another, and in the process demonstrated it conclusively by experiment in front of his whole class! By passing an electric current through a metal wire suspended above a magnetic compass, Oersted was able to produce a definite motion of the compass needle in response to the current. What began as conjecture at the start of the class session was confirmed as fact at the end. Needless to say, Oersted had to revise his lecture notes for future classes! His serendipitous discovery paved the way for a whole new branch of science: electromagnetics. The magnetic field encircles this straight piece of current-carrying wire, the magnetic flux lines having no definite "north" or "south' poles. 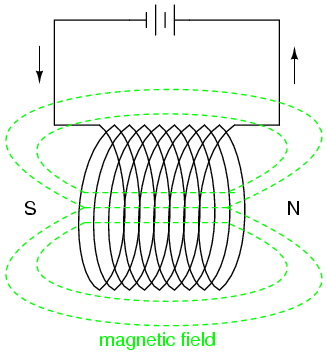 The amount of magnetic field force generated by a coiled wire is proportional to the current through the wire multiplied by the number of "turns" or "wraps" of wire in the coil. This field force is called magnetomotive force (mmf), and is very much analogous to electromotive force (E) in an electric circuit. An electromagnet is a piece of wire intended to generate a magnetic field with the passage of electric current through it. Though all current-carrying conductors produce magnetic fields, an electromagnet is usually constructed in such a way as to maximize the strength of the magnetic field it produces for a special purpose. Electromagnets find frequent application in research, industry, medical, and consumer products. As an electrically-controllable magnet, electromagnets find application in a wide variety of "electromechanical" devices: machines that effect mechanical force or motion through electrical power. 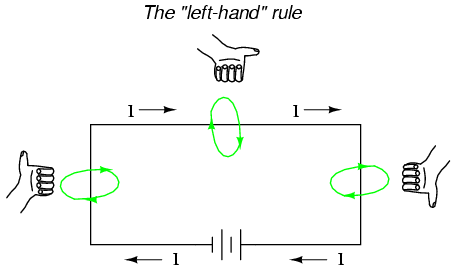 Perhaps the most obvious example of such a machine is the electric motor. 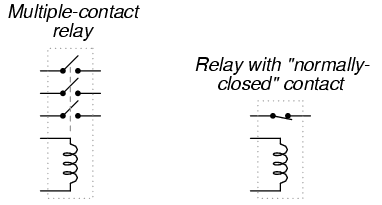 Relays can be constructed to actuate multiple switch contacts, or operate them in "reverse" (energizing the coil will open the switch contact, and unpowering the coil will allow it to spring closed again).